As St. Francis feeds the birds from a dish in his hands, a cat and turtle wait patiently at his feet. 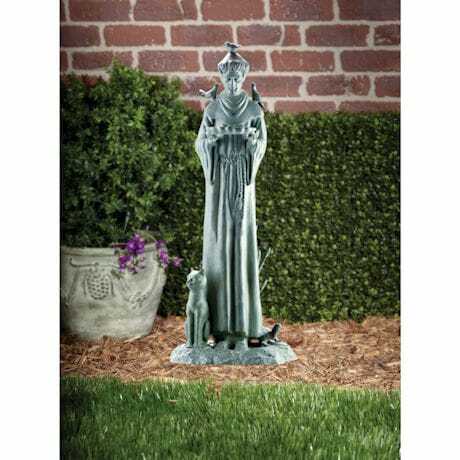 A serene and loving presence in your garden or inside your home, cast aluminum sculpture has a hand-applied verdigris finish. Impressively sized and beautiful detailed from all sides. 13"w x 30"h x 11"d. 15 lbs. This is a drop ship item. Please allow 2-3 weeks for delivery, no rush/overnight is available. Item can only be shipped within the Continental US.